A statue of the famous explorer, John Cabot, adorns the harbourside at Cape Bonavista in Newfoundland, Canada. John Cabot was a famous explorer who landed at either Cape Bonavista, Newfoundland, possibly St. John's, the exact location is unknown, in June of 1497. The government recognizes Cape Bonavista as his official landing spot where he stayed ashore and claimed the land. The next expedition in 1498 which John Cabot took after his return trip from Cape Bonavista, was his last. John Cabot and his crew were in distress at sea and were never found again. 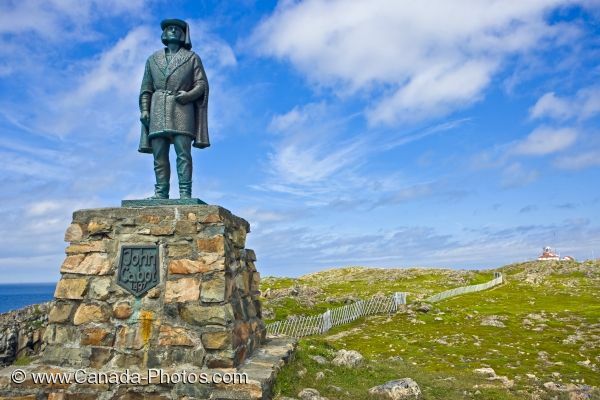 A statue of John Cabot now stands at Cape Bonavista along the Discovery Trail in Newfoundland, Canada. Statue of John Cabot who first landed at Cape Bonavista in 1497. Cape Bonavista, Bonavista Peninsula, Discovery Trail, Bonavista Bay, Newfoundland, Newfoundland Labrador, Canada. Picture of a statue of John Cabot along the Discovery Trail in Cape Bonavista in Newfoundland, Canada.